← Can wind power be scaled up to 24 TW by 2050? How safe are utility-scale energy storage systems? USDOE. December 2014. Energy Storage Safety Strategic Plan. U.S. Department of Energy, Office of Electricity Delivery and Energy Reliability. The safe application and use of energy storage technology knows no bounds. An energy storage system (ESS) will react to an external event, such as a seismic occurrence, regardless of its location in relation to the meter or the grid. Similarly, an incident triggered by an ESS, such as a fire, is ‘blind’ as to the location of the ESS in relation to the meter. Most of the current validation techniques that have been developed to address energy storage safety concerns have been motivated by the electric vehicle community, and are primarily focused on Li-ion chemistry and derived via empirical testing of systems. Additionally, techniques for Pb-acid batteries have been established, but must be revised to incorporate chemistry changes within the new technologies. Moving forward, all validation techniques must be expanded to encompass grid-scale energy storage systems, be relevant to the internal chemistries of each new storage system and have technical bases rooted in a fundamental-scientific understanding of the mechanistic responses of the materials. Grid energy storage systems are “enabling technologies”; they do not generate electricity, but they do enable critical advances to modernize the electric grid. For example, there have been numerous studies that have determined that the deployment of variable generation resources will impact the stability of grid unless storage is included.5 Additionally, energy storage has been demonstrated to provide key grid support functions through frequency regulation.6 The diversity in the performance needs and deployment environments drive the need of a wide array of storage technologies. Often, energy storage technologies are categorized as being high-power or high-energy. This division greatly benefits the end user of energy storage systems because it allows for the selection of a technology that fits an application’s requirements, thus reducing cost and maximizing value. Frequency regulation requires very rapid response, i.e. high-power, but does not necessarily require high energy. By contrast, load-shifting requires very high-energy, but is more flexible in its power needs. Uninterruptible power and variable generation integration are applications where the needs for high-power versus high-energy fall somewhere in between the aforementioned extremes. Figure 1 shows the current energy storage techniques deployed onto the North American grid.7 This variety in storage technologies increases the complexity in developing a single set of protocols for evaluating and improving the safety of grid storage technologies and drives the need for understanding across length scales, from fundamental materials processes through full scale system integration. 5 Denholm, Paul; Ela, Erik; Kirby, Brendan; Milligan, Michael. The variety of deployment environments and application spaces compounds the complexity of the approaches needed to validate the safety of energy storage systems. The difference in deployment environment impacts the safety concerns, needs, risk, and challenges that affect stakeholders. For example, an energy storage system deployed in a remote location will have very different potential impacts on its environment and first responder needs than a system deployed in a room in an office suite, or on the top floor of a building in a city center. The closer the systems are to residences, schools, and hospitals, the higher the impact of any potential incident regardless of system size. Pumped hydro is one of the oldest and most mature energy storage technologies and represents 95% of the installed storage capacity. Other storage technologies, such as batteries, flywheels and others, make up the remaining 5% of the installed storage base, are much earlier in their deployment cycle and have likely not reached the full extent of their deployed capacity. Though flywheels are relative newcomers to the grid energy storage arena, they have been used as energy storage devices for centuries with the earliest known flywheel being from 3100 BC Mesopotamia. Grid scale flywheels operate by spinning a rotor up to tens of thousands of RPM storing energy in a combination of rotational kinetic energy and elastic energy from deformation of the rotor. These systems typically have large rotational masses that in the case of a catastrophic radial failure need a robust enclosure to contain the debris. However, if the mass of the debris particles can be reduced through engineering design, the strength, size and cost of the containment system can be significantly reduced. As electrochemical technologies, battery systems used in grid storage can be further categorized as redox flow batteries, hybrid flow batteries, and secondary batteries without a flowing electrolyte. 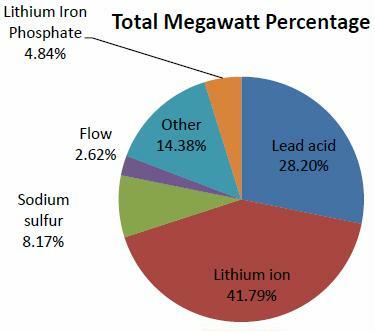 For the purposes of this document, vanadium redox flow batteries and zinc bromine flow batteries are considered for the first two categories, and lead-acid, lithium ion, sodium nickel chloride and sodium sulfur technologies in the latter category. As will be discussed in detail in this document, there are a number of safety concerns specific to batteries that should be addressed, e.g. release of the stored energy during an incident, cascading failure of battery cells, and fires. A reactive approach to energy storage safety is no longer viable. The number and types of energy storage deployments have reached a tipping point with dramatic growth anticipated in the next few years fueled in large part by major, new, policy-related storage initiatives in California14, Hawaii15, and New York.16 The new storage technologies likely to be deployed in response to these and other initiatives are maturing too rapidly to justify moving ahead without a unified scientifically based set of safety validation techniques and protocols. A compounding challenge is that startup companies with limited resources and experience in deployment are developing many of these new storage technologies. Standardization of the safety processes will greatly enhance the cost and viability of new technologies, and of the startup companies themselves. The modular nature of ESS is such that there is just no single entity clearly responsible for ESS safety; instead, the each participant in the energy storage community has a role and a responsibility. The following sections outline the gaps in addressing the need for validated grid energy storage system safety. To date, the most extensive energy storage safety and abuse R&D efforts have been done for Electric Vehicle (EV) battery technologies. These efforts have been limited to lithium ion, lead-acid and nickel metal hydride chemistries and, with the exception of grid-scale lead-acid systems, are restricted to smaller size battery packs applicable to vehicles. The increased scale, complexity, and diversity in technologies being proposed for grid- scale storage necessitates a comprehensive strategy for adequately addressing safety in grid storage systems. The technologies deployed onto the grid fall into the categories of electro-chemical, electromechanical, and thermal, and are themselves within different categories of systems, including CAES, flywheels, pumped hydro and SMES. This presents a significant area of effort to be coordinated and tackled in the coming years, as a number of gap areas currently exist in codes and standards around safety in the field. R&D efforts must be coordinated to begin to address the challenges. An energy storage system can be categorized primarily by its power, energy and technology platform. For grid-scale systems, the power/energy spectrum spans from smaller kW/kWh to large MW/MWh systems. Smaller kW/kWh systems can be deployed for residential and community storage applications, while larger MW/MWh systems are envisioned for electric utility transmission and distribution networks to provide grid level services. This is in contrast to electric vehicles, for which the U.S. Advanced Battery Consortium (USABC) goals are both clearly defined and narrow in scope with an energy goal of 40 kWh. While in practice some EV packs are as large as 90 kWh, the range of energy is still small compared with the grid storage applications. This research is critical to the ability of first responders to understand the risks posed by ESS technologies and allow for the development of safe stratagies to minimize risk and mitigate the event. Furthermore, the diversity of battery technologies and stationary storage systems is not generally present in the EV community. Therefore, the testing protocols and procedures used historically and currently for storage systems for transportation are insufficient to adequately address this wide range of storage systems technologies for stationary applications. Table 1 summarizes the high level contrast between this range of technologies and sizes of storage in the more established area of EV. The magnitude of effort that must be taken on to encompass the needs of safety in stationary storage is considerable because most research and development to improve safety and efforts to develop safety validation techniques are in the EV space. Notably, the size of EV batteries ranges by a factor of two; by contrast, stationary storage scales across many orders of magnitude. Likewise, the range of technologies and uses in stationary storage are much more varied than in EV. Therefore, while the EV safety efforts pave the way in developing R&D programs around safety and developing codes and standards, they are highly insufficient to address many of the significant challenges in approaching safe development, installation, commissioning, use and maintenance of stationary storage systems. An additional complexity of grid storage systems is that the storage system can either be built on-site or pre-assembled, typically in shipping containers. These pre-assembled systems allow for factory testing of the fully integrated system, but are exposed to potential damage during shipping. For the systems built on site, the assembly is done in the field; much of the safety testing and qualification could potentially be done by local inspectors, who may or may not be as aware of the specifics of the storage system. Therefore, the safety validation of each type of system must be approached differently and each specific challenge must be addressed. Batteries and flywheels are currently the primary focus for enhanced grid-scale safety. For these systems, the associated failure modes at grid-scale power and energy requirements have not been well characterized and there is much larger uncertainty around the risks and consequences of failures. This uncertainty around system safety can lead to barriers to adoption and market success, such as difficulty with assessing value and risk to these assets, and determining the possible consequences to health and the environment. To address these barriers, concerted efforts are needed in the following areas: • Materials Science R&D – Research into all device components • Engineering controls and system design • Modeling • System testing and analysis • Commissioning and field system safety research It is a notable challenge within the areas outlined above to develop understanding and confidence in relating results at one scale to expected outcomes at another scale, or predicting the interplay between components, as well as protecting against unexpected outcomes when one or more failure mode is present at the same time in a system. Extensive research, modeling and validation are required to address these challenges. Furthermore, it is necessary to pool the analysis approaches of failure mode and effects analysis (FMEA) and to use a safety basis in both research and commissioning to build a robust safety program. Furthermore, identifying, responding and mitigating to any observed safety events are critical in validating the safety of storage. A holistic view with regard to setting standards to ensure thorough safety validation techniques is the desired end goal; the first step is to study on the R&D level failure from the cell to system level, and from the electrochemistry and kinetics of the materials to module scale behavior. Detailed hazards analysis must be conducted for entire systems in order to identify failure points caused by abuse conditions and the potential for cascading events, which may result in large scale damage and/or fire. While treating the storage system as a “black box” is helpful in setting practical standards for installation, understanding the system at the basic materials and chemistry levels and how issues can initiate failure at the cell and system level is critical to ensure overall system safety. Moreover, while physical hazards are often considered, health and environmental safety issues also need to be evaluated to have a complete understanding of the potential hazards associated with a battery failure. These may include the toxicity of gas species evolved from a cell during abuse or when exposed to abnormal environments, 30,31 toxicity of electrolyte during a cell breech or spill in a Vanadium redox flow battery (VRB),32 environmental impact of water runoff used to extinguish a battery fire containing heavy metals.33 Flywheels provide an entirely different set of considerations, including mechanical containment testing and modeling, vacuum loss testing, and material fatigue testing under stress. The topic of Li-ion battery safety is rapidly gaining attention as the number of battery incidents increases. Recent incidents, such as a cell phone runaway during a regional flight in Australia and a United Parcel Service plane crash near Dubai, reinforce the potential consequence of Liion battery runaway events. The sheer size of grid storage needs and the operational demands make it increasingly difficult to find materials with the necessary properties, especially the required thermal behavior to ensure fail-proof operation. The main failure modes for these battery systems are either latent (manufacturing defects, operational heating, etc.) or abusive (mechanical, electrical, or thermal). Any of these failures can increase the internal temperature of the cell, leading to electrolyte decomposition, venting, and possible ignition. While significant strides are being made, major challenges remain in combating solvent flammability still remain, which is the most significant area that needs improvement to address safety of Li-ion cells, and is therefore discussed here in greater detail. To mitigate thermal instability of the electrolyte, a number of different approaches have been developed with varied outcomes and moderate success. Conventional electrolytes typically vent flammable gas when overheated due to overcharging, internal shorting, manufacturing defects, physical damage, or other failure mechanisms. The prospects of employing Li-ion cells in applications depend on substantially reducing the flammability, which requires materials developments (including new lithium salts) to improve the thermal properties. One approach is to use fire retardants (FR) in the electrolyte as an additive to improve thermal stability. Most of these additives have a history of use as FR in the plastics industry. Broadly, these additives can be grouped into two categories—those containing phosphorous and that containing fluorine. A concerted effort to provide a hazard assessment and classification of the event and mitigation when an ESS fails, either through internal or external mechanical, thermal, or electrical stimulus is needed by the community. Electrolyte Safety R&D The combustion process is a complex chemical reaction by which fuel and an oxidizer in the presence of heat react and burn. Convergence of heat (an oxidizer) and fuel (the substance that burns) must happen to have combustion. The oxidizer is the substance that produces the oxygen so that the fuel can be burned, and heat is the energy that drives the combustion process. In the combustion process a sequence of chemical reactions occur leading to fire.41 In this situation a variety of oxidizing, hydrogen and fuel radicals are produced that keep the fire going until at least one of the three constituents is exhausted. The higher energy density of Li-ion cells can only result in a more volatile device, and while significant efforts have been put forth to address safety, significant research is still needed. To improve safety of Li-ion batteries, the electrolyte flammability needs significant advances or further mitigation is needed in areas that will contain the effects of failures to provide graceful failures with safer outcomes in operation. Electrodes, separators, current collectors, casings, cell format headers and vent ports While electrolytes are by far the most critical component in Li-ion battery safety, research has been pursued into safety considerations around the other components of the cell. These factors can become more critical as research continues in wider ranges of chemistries for stationary storage. Capacitors Electrostatic capacitors are a major failure mechanism in power electronics. These predominately fail because of the strong focus on low cost devices, and low control over manufacturing. In response, they are used at a highly de-rated level, and often with redundant design. When they fail they often show slow degradation with decreasing resistivity leading eventually to shorting. Cascading failures can lead to higher consequence failures elsewhere in a system. Arcs or cascading failures can occur. The added complexity of redundant design is a safety risk. While there is a niche market for high reliability capacitors, they are not economically viable for most applications, including grid storage. These devices are made of precious metals and higher quality ceramic processing that leads to fewer oxygen vacancies in the device. Polymer capacitors can have a safety advantage as they can be self-healing, and therefore graceful failure; however these are poor performers at elevated temperatures and are flammable. Currently, the low cost and low reliability of capacitors make them a very common component that fails in devices, affecting the power electronics and providing a possible trigger for a cascading failure. While improved reliability has been achieved in capacitors such devices are cost prohibitive due to their manufacturing and testing. Development of improved capacitors at reasonable cost, or design to prevent cascading failures in the event of capacitor failure should be addressed. Pumps tubing and tanks Components specific to flow battery, and hybrid flow battery technologies have not been researched in the context of safety for battery technology. These include components such as pumps, tubing and storage tanks. Research from other areas that use similar components can be a starting point, but these demonstrate how the range of components is much broader than current R&D in battery safety. Manufacturing defects The design of components and testing depends on understanding the range of purity in materials, and conformity in engineering. Defects are a large contributor to shorts in batteries for example. Understanding the reproducibility among parts, and the influence of defects on failure is critical to understanding and designing for safer storage systems. Software Analytics. In this day and age of information technology, any comprehensive research, development, and deployment strategy for energy storage should be rounded out with an appropriate complement of software analytics. Software is on a par with hardware in importance, not only for engineering controls, but for performance monitoring; anomaly detection, diagnosis, and tracking; degradation and failure prediction; maintenance; health management; and operations optimization. Ultimately, it will become an important factor in improving overall system and system-of-systems safety. As with any new, potentially high consequence technology, improving safety will be an ongoing process. By analogy with airline safety, energy storage projects which use cutting-edge technologies would benefit from “black boxes” to record precursors to catastrophic failures. The black boxes would be located off-site and store minutes to months of data depending on the time scale of the phenomena being sensed. They would be required for large-scale installations, recommended for medium-scale installations, and optional for small installations. Evolving standards for what and how much should be recorded will be based on the results from research as well as experience. Since some energy storage technologies are still early in their development and deployment, there should be an emphasis on developing safety cases. Safety cases should cover the full range of safety events that could reasonably be anticipated, and would therefore highlight the areas in which software analytics are required to ensure the safety of each system. Each case would tell a story of an initiating event, an assessment of its probability over time, the likely subsequent events, and the likely final outcome or outcomes. The development of safety cases need not be onerous, but they should demonstrate to everyone involved that serious thought has been given to safety. The established tests for electrical, mechanical and environmental conditions are therefore tailored to identifying and quantifying the consequence and likelihood of failure in lead-acid and lithium ion technologies with typical analyses that include burning characteristics, off-gassing, smoke particulates, and environmental run off from fire suppression efforts. Even for the most studied abuse case of lithium ion technologies, some tests have been identified as very crude or ineffective with limited technical merit. For example, the puncture test, used to replicate failure under an internal short, is widely believed to lack the ability to accurately to mimic this particular failure mode. These tests are less likely to reproduce potential field failures when applied to technologies for which they were not originally designed. The above testing relates exclusively to cell/pack/module level and does not take into consideration the balance of the storage system. Other tests on Li-ion system are targeted at invoking and quantifying specific events; for example, impact testing and overcharging tests probe the potential for thermal runaway which occurs during anode and cathode decomposition reactions. Other failure modes addressed by current validation techniques include electrolyte flammability, thermal stability of materials including the separators, electrolyte components and active materials, and cell-to-cell failure. Gap areas and opportunities An energy storage system deployed on the grid, whether at the residential (<10kW) or bulk generation scale on the order of MW, is susceptible to similar failures as described above for Li-ion. However, given the multiple chemistries and application space, there is a significant gap in our ability to understand and quantify potential failures under real-world conditions; in order to ensure safety as grid storage systems are deployed, it is critical to understand their potential failure modes within each deployment environment. Furthermore, it must be considered that grid-scale systems include at the very least: power electronics, transformers, switchgear, heating and cooling systems and housing structures or enclosures. The size and the variety of technologies necessitate a rethinking of safety work as it is adopted from current validation techniques in the electrified vehicle space. To address the component and system level safety concerns for all the technologies being developed for stationary energy storage, further efforts will be required to: understand these systems at the fundamental materials science, develop appropriate engineering controls, fire protection and suppression methods, system design, complete validation testing and analysis, and establish real world based models for operating. System level safety must also address several additional factors including the relevant codes, standards and regulations, the needs of first responders, and anticipate risks and consequences not covered by current CSR. The wide range of chemistries and operating conditions required for grid-scale storage presents a significant challenge for safety R&D. The longer life requirements and wider range of uses for storage require a better understanding of degradation and end of life failures under normal operating and abuse conditions. The size of batteries also necessitates a stronger reliance on modeling. Multi-scale models for understanding thermal runaway, and fire propagation; whether originated in the chemistry, the electronics, or external to the system; have not been developed. Currently gap areas for stationary energy storage exist from materials research and modeling through system life considerations such as operation and maintenance. Engineering controls and system design. Currently the monitoring needs of batteries, as well as effectiveness of means to separate battery cells and modules, or various fire suppression systems and techniques in systems have not been studied extensively. Individual companies and installations have relied on past experience in designing these systems. For example: Na battery installations have focused on mitigating the potential impact of the high operating temperature, Pb-acid batteries has focused on controlling failures associated with hydrogen build up, while in technologies that don’t use electrochemistry like flywheels, have focused on mechanical concerns such as run-out and high temperature, or change in chamber pressure. Detailed testing and modeling are required to fully understand the needs in system monitoring and containment of failure propagation. Rigorous design of safety features that adequately address potential failures are also still needed in most technology areas. Current efforts have widely focused on monitoring cell and module level voltages in addition to the thermal environment; however the tolerances for safe operation are not known for these systems. Further development efforts are needed to help manufacturers and installers understand the appropriate level of monitoring in order to safely operate a system and prevent failure resulting from internal short circuits, latent manufacturing defects or abused batteries from propagating to the full system. Modeling The size and cost of grid-scale storage system make it prohibitive to test full-scale systems, modeling can play a critical role in improved safety. Fire suppression Large-scale energy storage systems can mitigate risk of loss by isolating parts of a system in different transportation containers, or using materials or assemblies to section off batteries. Most current systems have automated and manually triggered fire suppression systems within the enclosure but have limited knowledge if such suppression systems will be useful in the event of fire. The interactions between fire suppressants and system chemistries must be fully understood to determine the effectiveness of fire suppression. Key variables include the: volume of suppressant required, rate of suppressant release, and distribution of suppressants. Basic assumptions about electrochemical safety have not been elucidated, for example it is not even clear whether a battery fire is of higher consequence than other types of fires, and if so at what scale this is of concern. The National Fire Protection Association (NFPA) has provided a questionnaire regarding suppressants for vehicle batteries. Tactics for suppression of fires involving electric-drive vehicle (EDV) batteries: a. How effective is water as a suppressant for large battery fires? b. Are there projectile hazards? c. How long must suppression efforts be conducted to place the fire under control and then fully extinguish it? d. What level of resources will be needed to support these fire suppression efforts? 1 e. Is there a need for extended suppression efforts? f. What are the indicators for instances where the fire service should allow a large battery pack to burn rather than attempt suppression? NFPA 13, Standard for the Installation of Sprinkler Systems,60 does not contain specific sprinkler installation recommendations or protection requirements for Li-ion batteries. Reports and literature on suppressants universally recommended the use of water.61 However, the quantity of water needed for a battery fire is large: 275-2639 gallons for a 40 kWh EV sized Liion battery pack. This is higher than recommended for internal combustion engine (ICE) vehicle fires. Summary. Science-based safety validation techniques for an entire energy storage system are critical as the deployments of energy storage systems expand. These techniques are currently based on previous industry knowledge and experience with energy storage for vehicles, as well as experience with grid-scale Pb-acid batteries. Now, they must be broadened to encompass gridscale systems. The major hurtle to this expansion is encompassing both much broader range in scale stationary storage systems, as well as the much broader range of technologies. Furthermore, the larger scale of stationary storage over EV storage necessitates the consideration of a wider range of concerns, beyond the storage device. This includes areas such as power electronics and fire suppression. The required work to develop validation is significant. As progress is made in understanding validation through experiment and modeling, these evidence-based results can feed into codes, regulations and standards, and can inform manufacturers and customers of stationary storage solutions to improve the safety of deployed systems. Currently, fire departments do not categorize ESS as stand-alone infrastructure capable of causing safety incidents independent of the systems that they support. Instead, fire departments categorize grid ESS as back-up power systems such as uninterruptible power supplies (UPS) for commercial, utility, communications and defense settings, or as PV battery-backed systems for on, or off-grid residential applications. This categorization results in limited awareness of ESS and their potential risks, and thus the optimal responses to incidents. This categorization of energy storage systems as merely back-up power systems also results in the treatment of ESS as peripheral to the risk management tools. No general, technology-independent standard for ESS integration into a utility or a stand-alone grid has yet been developed. Incident responses with standard equipment are tailored to the specific needs of the incident type and location, whether it’s two “pumper” engines and a “ladder” truck with two to four personnel, plus a Battalion Chief to act as Incident Commander, for a total of 9 to 13 personnel responding to an injury/accident, or a structure fire that requires five engines, two trucks, and two Battalion Chiefs for a total of 17 to 30 personnel. With each additional “alarm” struck will send another two to three “pumper” engines and a “ladder” truck. In all of these cases, the incident response personnel typically arrive on scene with only standard equipment. This equipment is guided by various NFPA standards for equipment on each apparatus, personal protective equipment (PPE), and other rescue tools. In responding to an ESS incident, the fire service seldom incorporates equipment specialized for electrical incidents. A number of unique challenges must be considered in developing responses to any energy storage incident. In particular, difficulties securing energized electrical components can present significant safety challenges for fire service personnel. Typically, the primary tasks are to isolate power to the affected areas, contain spills, access and rescue possible victims, and limit access to the hazard area. The highest priority is given to actions that support locating endangered persons and removing them to safety with the least possible risk to responders. Where the rescue of victims continues until it is either accomplished or determined that there are no survivors or the risk to responders is too great. Industrial fires can be quite dangerous depending on structure occupancy, i.e. the contents, process, and personnel inside. Water may be used from a safe distance on larger fires that have extended beyond the original equipment or area of origin, or which are threatening nearby exposures; however, determination of “safe” distance has been little researched by the fire service scientific community. Fire suppression and protection systems. Each ESS installation is guided by application of existing CSR that may not reflect the unique and varied chemistries in use. Fire-suppressant selection should be based on the efficacy of specific materials and needed quantities on site based on appropriate and representative testing, conducted in consultation with risk managers, fire protection engineers, and others, as well as alignment with existing codes and standards. For example, non-halogenated inert gas discharge systems may not be adequate for thermally unstable oxide chemistries, as they generate oxides in the process of heating, which may lead to combustion in oxygen deficient atmospheres. Ventilation requirements imposed by some Authorities Having Jurisdiction (AHJs) may work against the efficacy of these gaseous suppression agents. Similarly, water-based sprinkler systems may not prove effective for dissipating heat dissipation in large-scale commodity storage of similar chemistries. Therefore, additional research is needed to provide data on which to base proper agent selection for the occupancy and commodity, and to establish standards that reflect the variety of chemistries and their combustion profile. Current commodity classification systems used in fire sprinkler design (NFPA 13-Standard for Installation of Sprinkler Systems) do not have a classification for lithium or flow batteries. This is problematic, as the fire hazard may be significantly higher depending on the chemicals involved and will likely result in ineffective or inaccurate fire sprinkler coverage. Additionally, thermal decomposition of electrolytes may produce flammable gasses that present explosion risks. Verification and control of stored energy. Severe energy storage system damage resulting from fire, earthquake, or significant mechanical damage may require complete discharge, or neutralization of the chemistry, to facilitate safe handling of components. Though the deployment of PV currently exceeds that of ESS, there is still a lack of a clear response procedure to de-energize distributed PV generation in the field. Fire fighters typically rely on the local utility to secure supply-side power to facilities. In the case of small residential or commercial PV, the utility is not able to assist because the system is on the owner side of the meter, which presents a problem for securing a 600Vdc rooftop array. Identifying the PV integrators responsible for installation may not be possible, and other installers may be hesitant to assume any liability for a system they did not install. This leaves a vacuum for the safe, complete overhaul of a damaged structure with PV. Similarly, ESS faces the complication of unclear resources for assistance and the inabilities of many first responders to knowledgably verify that the ESS is discharged or de-energized. Post-incident response and recovery. Thermal damage to ESS chemistries and components presents unique challenges to the fire service community, building owners, and insurers. As evidenced in full-scale testing of EV battery fires, fire suppression required more water than anticipated, and significantly more in some cases. Additionally, confirming that the fire was completely extinguished was difficult due to the containment housings of EV batteries that can mask continued thermal reaction within undamaged cells. In one of the tests performed by Exponent, Inc., one battery reignited after being involved in a full-scale fire test some 22 hours post-extinguishment; in another case, an EV experienced a subsequent re-ignition 3 weeks post-crash testing. Governmental approvals and permits related to the siting, construction, development, operation, and grid integration of energy storage facilities can pose significant hurdles to the timely and cost effective implementation of any energy storage technology. The process for obtaining those approvals and permits can be difficult to navigate, particularly for newer technologies for which the environmental, health, and safety impacts may not be well documented or understood either by the agencies or the public. “Cause of NAS Battery Fire Incident” NGK Insulators, LTD. June, 2012. 23 A. V. Van Zyl; C.-H Dustmann (Nov. 1995). “Safety Aspects of Zebra High Energy Batteries,” in Conference Proceedings, WEVA Conference for Electric Vehicle Research, Development and Operation, November 13, 14, 15, 1995; Paris. Bruxelles, Belgium. pp. 57–63. 24 Current Status of Health and Safety Issues of Sodium/Metal Chloride (Zebra) Batteries” NREL/TP-460-25553. November, 1998. 25 A. J. Grid Energy Storage Strategy. U.S. Department of Energy, Dec. 2013. Salkind, A. G. Cannone, F. A. Trumbure in “The Handbook of Batteries” D. Linden and T. B. Reddy, 3rd Edition, 2002, pp. 23.77-23.78. 26 A. W. Metwally “Generic environmental and safety assessment of five battery energy storage systems”, Electr. Power Res. Inst. 1982 27 D. P. Abraham, E. P. Roth, R. Kostecki, K. McCarthy, S. MacLaren, D. H. Doughty, “Diagnostic examination of thermally abused high-power lithium-ion cells” J. Power Sources, 161. 2006, pp. 648-657 28 G. Nagasubramanian and C. J. Orendorff, “Hydrofluoroether electrotes for lithium-ion batteries: Reduces gas decomposition and nonflammable” J. Power Sources, 196. 2011, pp. 8604-8609. 29 Mikolajczak, Celina; Kahn, Michael; White, Kevin; Long, Richard Thomas. “Lithium-Ion Batteries Hazard and Use Assessment.” Exponent Failure Analysis Associates, Inc. July 2011. 31 D. P. Abraham, E. P. Roth, R. Kostecki, K. McCarthy, S. MacLaren, D. H. Doughty, “Diagnostic examination of thermally abused high-power lithium-ion cells” J. Power Sources, 161. 2006, pp. 648-657. 32 “Toxicology Profile for Vanadium” U.S. Department of Health and Human Services, Public Health Service, Agency for Toxic Substances and Disease Registry. September 2012. Wesoff, Eric. “Battery Room Fire at Kahuku Wind-Energy Storage Farm.” Green Tech Grid. August 2012.